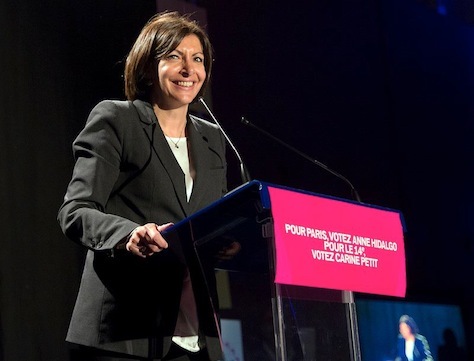 Anne Hidalgo won a strong victory to become Paris’s first female mayor, extending the electoral hold of the Parti socialiste (PS, Socialist Party) in the French capital. Hidalgo, who has served as France’s first deputy mayor under the administration of Bertrand Delanoë since 2001, won the election by a larger-than-expected margin, besting Nathalie Kosciusko-Morizet, a moderate former environmental minister and a rising star of the French right, by a margin of around 54.5% to 45.5%. Kosciusko-Morizet narrowly won the first round of the election on March 23, but polls showed that Hidalgo always had a clearer path to victory in the runoff, thanks to a large reservoir of green and other leftist voters. Despite the margin, Kosciusko-Morizet ran a strong race in a city that has veered further to the left over the past 15 years — a wild swing from the two decades that Jacques Chirac served as mayor (before winning the French presidency in 2005). Though Kosciusko-Morizet lost Sunday’s election, the center-right Union pour un mouvement populaire (UMP, Union for a popular movement) made marginal gains on the Paris city council, and Kosciusko-Morizet strengthened her profile by taking on the challenge of a campaign that was always going to be a stretch for the UMP.